Sen. Rand Paul (R-Kentucky) unveiled a formal declaration of war against the jihadist group Islamic State (also known as ISIS or ISIL) on Monday morning. In a statement, Paul’s office said he would introduce the resolution declaring war on ISIS when the Senate begins its next session in December. 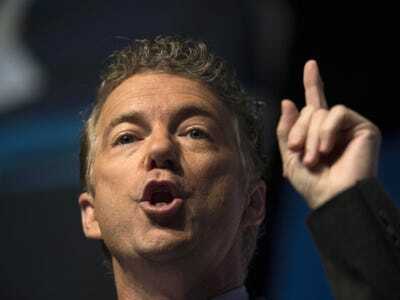 Paul, a libertarian-oriented conservative looking at a 2016 presidential bid, is among those who have repeatedly argued President Barack Obama has overstepped his constitutional authority by not having Congress authorise the US fight against the jihadists in Syria and Iraq. Instead, the White House has relied on resolutions passed by Congress in 2001 and 2002 that authorised the use of force in Iraq and Afghanistan. In addition to declaring war on ISIS, Paul’s resolution would terminate the 2002 authorization of military force in Iraq and set an expiration date for the 2001 resolution that applied to Afghanistan. The White House has argued the earlier authorizations of military force can still be used since they were aimed at Al Qaeda, which was a forerunner to ISIS. Paul’s resolution was first reported by The New York Times on Sunday night. His office released the full text in its statement on Monday morning. In it, Paul cited several founding fathers to bolster his arguments. “Whereas President George Washington, who presided over the Constitutional Convention, lectured: ‘The Constitution vests the power of declaring war with Congress. Therefore no offensive expedition of importance can be undertaken until after they have deliberated upon the subject, and authorised such a measure,” the resolution declared. Both the Obama administration and Paul have faced accusations of flip-flopping in the fight against the Islamic State. Obama, who vowed to withdraw troops from Iraq, has nevertheless gradually expanded the US’ military’s role in the effort to battle ISIS in both that country and Syria. Meanwhile, Paul has sent mixed signals about how much whether he supports any the US military intervention in the region and whether Obama is at fault for the growth of jihadist militants there. Paul told the Times the war authorization issue should be a rallying point for conservative critics of the Obama administration. This joint resolution may be cited as the ”Declaration of War against the Organisation known as the Islamic State”. SEC. 2. DECLARATION OF A STATE OF WAR BETWEEN THE PEOPLE AND GOVERNMENT OF THE UNITED STATES AGAINST THE ORGANISATION KNOWN AS THE ISLAMIC STATE. (a) DECLARATION. — The state of war between the United States and the organisation referring to itself as the Islamic State, also known as the Islamic State of Iraq and the Levant (ISIL) and the Islamic State of Iraq and Syria (ISIS), which has been thrust upon the United States, is hereby formally declared pursuant to Article I, section 8, clause 11, of the United States Constitution. (b) AUTHORIZATION. — The President is hereby authorised and directed to use the Armed Forces of the United States to protect the people and facilities of the United States in Iraq and Syria against the threats posed thereto by the organisation referring to itself as the Islamic State, also known as the Islamic State of Iraq and the Levant (ISIL) and the Islamic State of Iraq and Syria (ISIS). (B) based on affiliation with the organisation referring to itself as the Islamic State, also known as the Islamic State of Iraq and the Levant (ISIL) and the Islamic State of Iraq and Syria (ISIS). (2) APPLICABILITY OF OTHER REQUIREMENTS. — Nothing in this resolution supersedes any requirement of the War Powers Resolution (50 U.S.C. 1541 et seq.). The authorization for the Use of Military Force Against Iraq Resolution of 2002 (Public Law 107 — 243; 50 U.S.C. 1541 note) is hereby repealed. The Authorization for the Use of Military Force (Public Law 107 — 40; 50 U.S.C. 1541 note) does not provide any authority for the use of military force against the organisation referring to itself as the Islamic State, and shall not be construed as providing such authority. The Authorization for the Use of Military Force (Public Law 107 — 40; 50 U.S.C. 1541 note) shall terminate on the date that is one year after the date of the enactment of this joint resolution.